At Gracious Veneers, we proudly tailor our services to meet the needs of each individual, taking time to understand the requirement and make a goal to fulfil it. Clear values is what we rely on. We believe that connection with nature contributes to the physical well being as nature heals, soothes and restore our health as well as our environment. Hence, our aim is to deliver a small part of nature in your life. 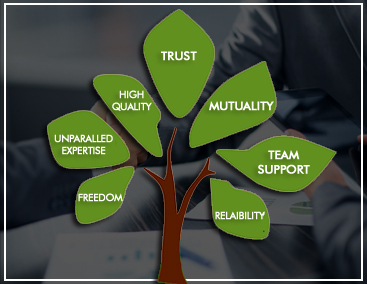 Our philosophy is based on immense trust, high standardized quality, efficient services , unparalleled expertise, mutuality, freedom , reliability and team support. We strive to develop and maintain long-lasting relationships, based on trust with our business partners, direct clients, distributors or agents. We innovate designs. We also believe customization as every client has a specific need to counter. To ensure that the finished product meets the client requirement, our team take responsibility to assure it. We make sure that quality of product we deliver is best in market. Hence, we make it a point that whatever we do, we do it the best. We have a wide range of products, which gives the ability to costumer to choose from a varied sector and not restricting to a set. Experiencing veneer since 1980, which is undoubtedly reflected in the quality of product and the extensive range. Quality is a term to counter, which the company cannot compromise. We assure to develop quality product that you can rely on.